When The LEGO Movie came out it was an instant hit. Now that it has been out for a while and was released on DVD I thought it would be interesting to gather information on how The LEGO Movie was made. If you have a boy who is into The LEGO Movie or who loves making LEGO animations I hope he will find this information we gathered really interesting. I just love when passions and learning mash up, don’t you? So let’s go over a few quick things. Animal Logic played a big part in making the movie–they also made Happy Feet. Your boy might find this article on their role in The LEGO Movie interesting. There are some great photos there as well. I like the way they researched the lands by, for example, using old movies and and photos of ghost towns to transform their wild west land into LEGO form. I also found it really neat that they wanted to use the great builds from LEGO fans, such as Bruce Lowell who had his taco, donut, hot dog and a skull featured in the movie. See his builds in our Artist in LEGO Bricks interview with Bruce. Some of the builds you see in the film were completely out of LEGO such as Benny’s spaceship while others are all digital. According to this article about the making of The LEGO Movie, “there are a total of 3,863,484 unique Lego bricks seen in the movie. But if you were to recreate the entire film only using Legos, you’d need 15,080,330, the studio (Warner Bros.) said.” What boy wouldn’t love to get his hands on that many LEGO bricks! When I first saw the trailers for the movie I thought that this was a stop-motion film as so many brick shorts have been stop-motion but it was actually made using CG (computer generated) 3-D animation according to this ScreenCrush article. One of the main tools used in the making of the movie was LEGO Digital Designer. It is super easy to use and my son and I have learned a lot by using and built some neat LEGO creations with it. If your boy has not tried it yet you should introduce him to it. Best of all it is totally free. You do have to download it but it is worthwhile having on your computer. The amount a boy will learn from this one tool alone makes this a must do activity. Knowing it was used to create the movie makes it all the cooler. They then moved those designs into other software to complete the process. See this article on Making a 3D LEGO Minifig for the type of thing they did. Here are a couple of additional good articles on the movie making process: The LEGO Movie, An Interview with Some of the Creators and Brick by Brick: How Animal Logic Crafted The LEGO Movie. Just in case all of those resources that didn’t satisfy your boy’s need to know everything about how they made The LEGO Movie, he can watch these videos for extra details. The first video is a bit odd as it is a collection of clips but it shows a lot of neat things so I decided to include it. This one is my favorite as it has a lot of movie clips and great details. It also briefly talks about the history of LEGO. If you only watch one, this is the one I would suggest. The LEGO Movie special on Network 7’s Sunday Night from Animal Logic on Vimeo. So. 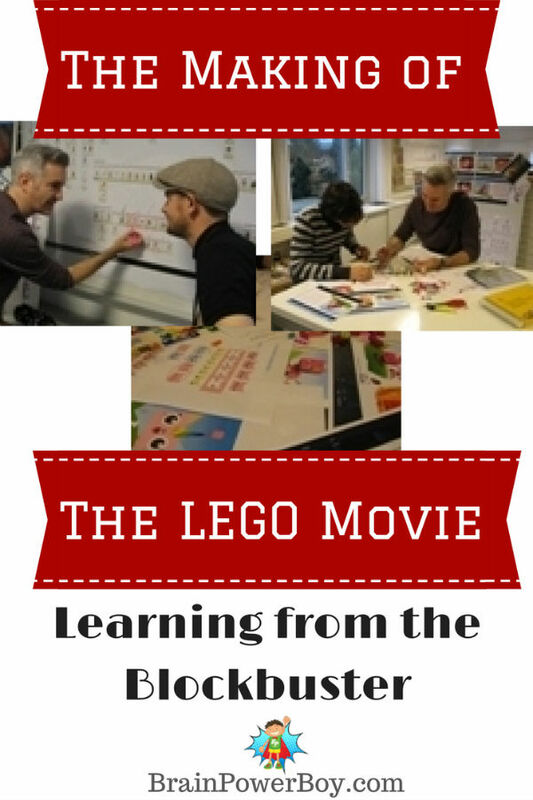 . . as you can see there is a lot of fun things to learn about, and from, The LEGO Movie. Your boys can learn more about storytelling, character creation and development, animation, design, using software such as LEGO Digital Designer to make his own creations and much more. I hope your boy enjoys learning more about The LEGO Movie by using the resources above. Let him make his own LEGO mini-movie. I’m sure he will enjoy it and learn a lot in the process. Please feel free to leave a comment below to tell us what other LEGO posts you would like to see on Brain Power Boy. Follow our Learning LEGO Style Pinterest Board! We share a lot of wonderful ideas for learning with LEGO on a regular basis. I absolutely love this post. I love being able to show my kids the world behind how things are made. I can see us having a few hours of fun with all the goodies in this post. We’re going to start this afternoon with that third video. I can’t wait to see what ideas these spark in my boys. The 3rd video is a great place to start. Have fun! Oh wow! I never considered how my son could learn from the Lego Movie. Thanks so much for sharing this. Thanks for the comment. If my son is interested in something, like The LEGO Movie, we usually find a way to help him learn a thing or two all in a very fun and natural way. This is fascinating! Thanks for sharing at the Love to Learn Linky! My daughters LOVE the lego movie and I think they’ll get a real kick out of the videos you’ve shared. Thanks so much for your comment. I am glad your daughters will enjoy them. Have fun! Lego really is fantastic isn’t it! We have used Lego Digital Designer and loved it! Thank you for sharing your post on my facebook page. We have used it too and it is a lot of fun! Thanks for allowing us to share.